What is Degenerative Disc Disease or Spondylosis? Degenerative disc disease and spondylosis is a condition in which natural, age-related wear-and-tear on a disc and spine causes possible pain, instability, and other symptoms. Although the name suggests that this is a disease, that is an inaccurate designation. As these findings can be normal age-related degenerative findings and do not necessarily result in long-term disability. Many cases of degenerative disc disease or spondylosis can be managed with non-surgical treatment methods. Additionally, the term degenerative implies that symptoms will get worse over time. 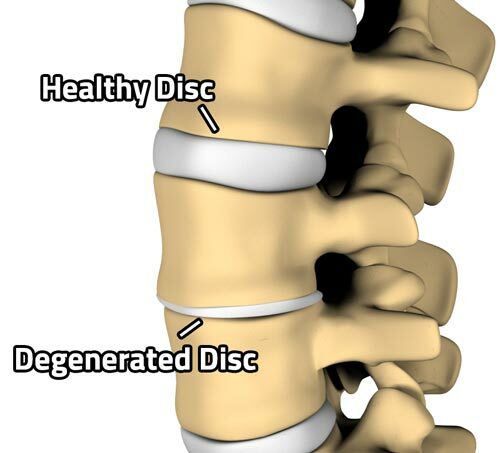 However, this term does not refer to the symptoms but is describing the process of a disc degenerating over many years. Degenerative disc disease and spondylosis most commonly occurs in the cervical spine (neck) or the lumbar spine (lower back) as these areas of the spine are most susceptible to wear-and-tear or injury. Exact symptoms will depend on the location of the disc, but you will probably feel pain in your back and neck. Pain in your lower back or buttocks, (lumbar disc degeneration); or neck or shoulder (cervical disc degeneration). Nagging, severe, or radiating pain that comes and goes and can last for a few days up to a few months. Pain that feels worse when you sit, but better when you change positions (e.g. moving, walking, lying down). Pain that increases when you bend, lift, or twist. The level of pain can be quite variable between individuals ranging from a nagging level of irritation to more severe and disabling pain. Non-surgical treatments such as pain medications, core strengthening, and physical therapy are recommended first. If these conservative measures fail to resolve the pain than occasionally diagnostic medial branch blocks or a discogram are used to identify the pain generator causing the neck or lower back pain. Transforaminal epidural or selective nerve root injections are used to diagnose and treat radiating (radicular) arm or leg pain due to disc herniations or bone spurs that cause nerve compression. If non-surgical treatments prove to be ineffective and severe pain still exists, surgery for degenerative disc disease should be considered to relieve the pain and improve mobility. A cervical disc replacement is a common procedure to treat radiating arm pain, where an artificial disc is inserted into and takes the place of the unhealthy disc. An artificial device is placed between the vertebrae to facilitate natural motion leading to increased movement and a better quality of life. If your pain generator is discovered to be facet based pain, an endoscopic medial branch nerve transection or rhizotomy can help treat your condition. Or if you suffer from pain radiating down your legs, an endoscopic microdiscectomy could be the answer. To find out if you suffer from degenerative disc disease or spondylosis and are a candidate for one of these procedures, schedule a free consultation and MRI review today.